The course includes 21 video lessons (200 minutes) and one 37-page exercise book with 296 Rhythm Exercises. 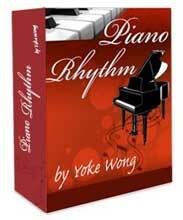 Rhythm Application - covering tango, cha cha, polish dance, polka. Before taking the piano rhythm course, I have some difficulties in isolating the underlining rhythm. Usually I just depend on my hearing to get by. After trying out your piano rhythm course just for a week, I can confidently tap out the rhythm using the single clef notation. I enjoy most is latin rhythm, especially tango. I am glad that I made the right decision to purchase the piano rhythm course and would not hesitate to recommend to anyone who wants to improve. I like your course very much. I am at the Eighth Rests and Notes , and by practicing these exercises in conjunction with a keyboard auto rhythm as per your recommendation , the course re enforces the syncopation timing, that is absolutely fantastic . No doubt that the more I work on it, the more that is beneficial to my piano playing. I would recommend this course to any friends who wish to improve their piano playing and thanks for all these lessons. There is a lot of fun to work on them. Your rhythm course is A++. Your rhythm course is A++. I have had some problems with rhythm but isolating the note values onto one line really helps. Thanks!! $$ well spent. Appreciate your Christian music and emphasis. This on-line course is really helpful for me to practice the piano after a long working day. The video is great to view it over and over at my own time, and with the simple arrangement of the music, I don't feel overwhelm with practicing/playing the piano. This course is great for thoses who want to improve sight reading and understand how rhythmic patterns work and you learn how to practice, Thanks Yoke!